Is your project on time, on budget, on the mark? Measuring your project performance is not as straight forward as simply comparing the schedule's progress or performance against the expectation, or baseline. When using BI to make projects and project portfolio performance and alignment available en masse to your organization, keep this in mind. If the intended audience is a general community of stakeholders, participants, etc., concepts such as earned value and cost/schedule indexes will not resonate nor are they likely to be fully understood. Think of the primary constraints on projects and use the strength of BI reporting from a common dashboard approach where you are utilizing portals to push out reports, scorecards and gauges that have computed the variance indexes and taken into account earned value. Here are some examples ... 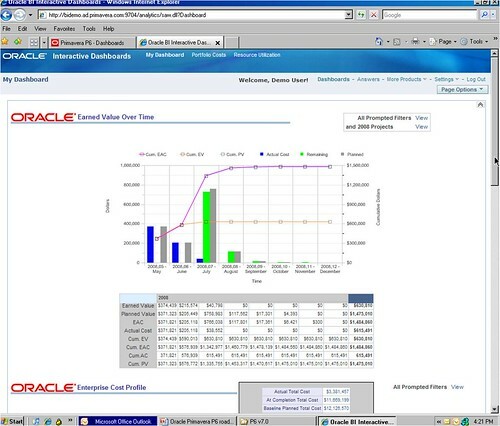 In the 1st screenshot below, you see a sample dashboard area with the CPI and SPI called out and the primary project constraints easy to see via cockpit gauges: resources, schedule, cost & the variances with index values which are calculated at the data warehouse or cube level. In the 2nd screenshot, I am showing a sample earned value report which allows an average user to view the project's progress against data that is spread out for the entire project duration and compared against a baseline. What is nice about EVM is that you are able to see how much work has been EARNED instead of simply the schedule progress or the money spent.